Ack, I’ve done it again! I’ve got about a dozen other posts in my head that haven’t yet made it to the page. Apparently I’ve been busy actually living my life before recording it for you all to read about… I’m trying to jump start myself again in several ways, so here’s a little blurb about my darling new home gym. So there’s a part of me that’s always wanted to be a great athlete and has enjoyed seasons of working out, hiking, running, doing fun things outdoors, etc. But then there’s another part of me that is REALLY lazy and lacks any form of self-discipline. So, it’s sometimes hard to get started again once I’ve fallen out of practice with working out, or whatever other hobby/activity I’ve fallen away from. Incidentally, another post that I need to catch you up on is my newly finished garage project. It looks SO good–I love it and I think you will too! 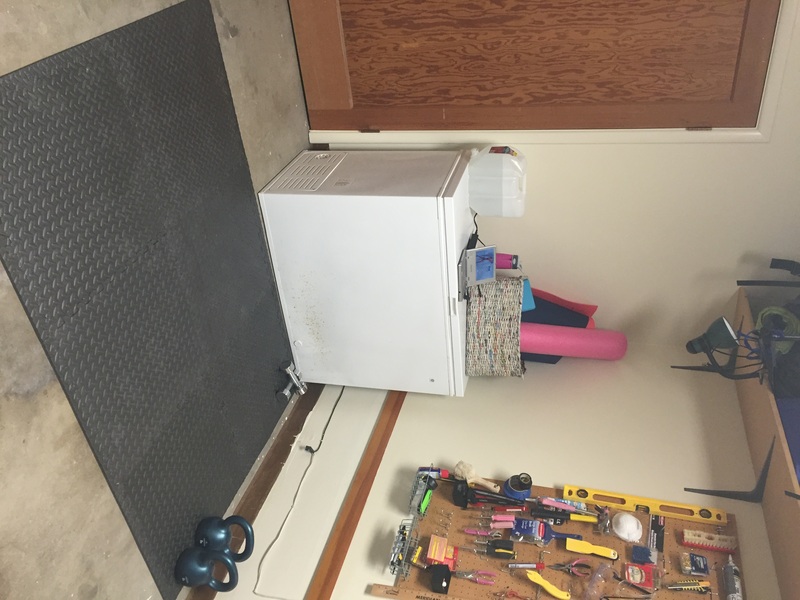 You do get a little teaser preview of my peg board in the picture below… But for now, suffice it to say that my garage reno resulted in a new little home gym, tucked into the corner between the refrigerator and the chest freezer. Yes, the fridge still lives in the garage, but eventually it will find it’s home in the kitchen, and you will hear all about it when that blessed day occurs–trust me. And I’m going to send the chest freezer home with Dad after he visits this fall, because it’s taking up precious space in my tiny one-car garage, and I probably don’t need to stock up on 5 turkeys and a dozen blackberry pies to get through the winter. So there it is, complete with padded mat, my little basketful of yoga paraphernalia, towels, etc. 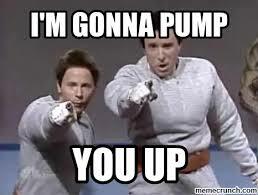 I resurrected one of my sister’s OLD portable DVD players, so I can play my workout DVDs and blast music from my living room. I need to find another iPhone docking stereo so that in the wintertime I won’t have to keep the house door open to the freezing garage and can just play music in the garage (the techno pop soundtrack of the videos just doesn’t do it for me). Last summer when I was having my crisis, I miraculously tapped into this incredible level of self-discipline that was buried very deep down inside me (very, very, very deep down…). I got up super early every day to meditate, pray, read, study, AND workout. It was so therapeutic, so I’m trying to get back into the rhythm of being more productive between the hours of 5 and 8 a.m. (Wish me luck/pray for me…) It’s a little bit weird doing this same set of workouts from Beachbody–21 Day Fix (it’s awesome, I highly recommend it). It reminds me of that worrisome, painful, unpredictable time last summer when I was doing anything I could to cling onto my life and marriage and not allow anything more to fall apart. But, on the other hand, it also reminds me of how positively and powerfully life-changing last summer was for me, and of the strength that God granted me–mind, body, and spirit–to persevere and keep moving forward, even when I was tempted to quit and crumble. I recognize that I’ve moved on enough from that season of my life such that I can begin re-engaging some activities that were a big part of that summer, and not feel too overwhelmed by the memories that come back when I do. Remember that old poster: “Today is the first day of the rest of your life…?” Well today was Day 1 of the next 21 Days of my life, so hopefully in three weeks I’ll feel and look a bit fitter than I do now. Lord knows, I ate a LOT of donuts this past winter. It’s time to hem it in, hit the mat, and start eating like a grown-up again. Thanks, Liz for sharing all your writing with me. I shall look from time to time to see what news things you have to say. My favorite so far is all you said about the laundromat.